Looking for a deal on a great Minnesota vacation but don’t want to blow the budget? Here, you’ll find vacation specials and packages to some of the area’s most sought after lodging, dining, and attractions. Check back frequently as new deals are often posted. Guaranteed you’ll find something that will make you—and your budget—happy! 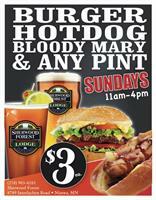 Join us on Sundays for our $3 tap beers, hamburgers, hot dogs and bloody Marys from 11:00 am - 4:00 pm. This Special is promoted by Brainerd Lakes Chamber.